SMi Group Reports: The official agenda for the 5th annual Biosimilars USA conference, which is taking place on the 14th and 15th November 2018 in New Jersey, USA, has been released. 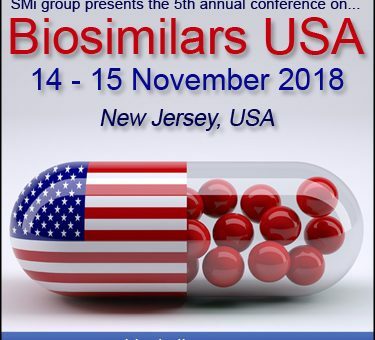 SMi is proud to present the return of the Biosimilars USA conference to New Jersey, USA on the 14thand 15th November 2018, for its 5th year running. This year’s event will explore the developments in biosimilar drug development by gathering a global audience of biosimilar experts and industry-thought leaders to discuss biosimilar manufacturing and commercialization considerations specific to the U.S.
At the two-day event, attendees will have the chance to hear from expert keynote speakers, as well as exclusive case study updates presented by top manufacturing and leading distributors of market-approved biosimilars, who will offer attendees a unique insight into the areas of manufacturing, commercialization, device design, uptake, switching, interchangeability, and regulations. Biosimilars USA will also offer attendees the opportunity to expand their knowledge of biosimilars even further by attending two half-day, interactive workshops on 13th November 2018, run by industry experts from ZS Associates, Alkermes, Inc. and Harpper & Scintoa. More information about the workshops and their respective leaders can be found on the event website. • Learn how to meet high GMP compliance when manufacturing outside of the U.S.